Between 27 and 29 April 2018, approximately seventy academics from all over Europe, met in Budapest to discuss fascism. Despite the concept’s increased abuse and misrepresentation in the public sphere in recent years, the majority historian congregation that descended upon Central European University (CEU) was primarily concerned with presenting new and innovative approaches to the intellectual study of fascism, rather than dispute the growing popularity of the label. The latter issue, however, would prove too urgent to ignore outright. The theme for the inaugural convention was “Comparative Fascist Studies and the Transnational Turn”. In the first of three public keynote lectures, Constantin Iordachi (professor at CEU and President of ComFaS), introduced the prevailing methodological and conceptual trajectories in the field, and further advocated for studies that incorporate multiple academic disciplines and international representation. Demonstrating this approach, no less than sixteen panels presented research projects that cut across nation, region, time, gender, and economics, to name a few. Equally as exciting, was the movement beyond the routine standard-bearers of fascist study, Germany and Italy, which included a host of case-studies that spanned the entire European continent and beyond. With regards to the transnational theme, panels (generally consisting of three thematically-corresponding presentations) were typically structured within a particular regional space. East-Central Europe was certainly a primary focus, but Scandinavia, the Iberian Peninsula, and Great Britain were also given due consideration. Other panels incorporated a particular conceptual aspect from which to offer a space for national comparison, including economic policy, intellectual and ideological transfers, and gender roles and female participation. Two standout case-studies, each filling multiple dedicated panels, offered a powerful juxtaposition of pragmatic and ideological national interests. Studies on Francoist Spain considered the concepts of race, violence, and corporatism, while the Independent State of Croatia and its Ustaša regime was considered through the lens of youth indoctrination, anti-Semitism as ideology, and the theoretical limitations of understanding such political movements. Collectively, both national-cases worked to challenge the more traditional center-periphery perspectives that still exist in fascist studies. The Croatian case can also be included among the upsurge in studies on fascism -past and present- pertaining specifically to the nations of Eastern and Central Europe. When considered together, the presentations on Latvia, Slovakia, the Czech Republic, Croatia, Romania, Russia, and Ukraine emphatically exhort a necessary reworking of two primary aspects on traditional fascist studies. First, approaches influenced by modernization theories, that place Germany and Italy exclusively at the center of fascist development in the 20th century, are directly challenged, both in terms of aesthetic and ideology, particularly when it comes to tracing the origins of contemporary ultra-nationalism and neo-fascism. Building upon this, the second issue questions fascism as being a uniquely epochal phenomenon. The panel on contemporary Eastern Europe highlighted modern authoritarian leadership in Russia and ultra-nationalist movements in the Ukraine, which worked together to historicize the entangled political and social developments within a longue durée perspective. Accompanying the diverse panel of discussions were pertinent public debates and lectures that engaged the relationships between radical right-wing politics of the 20th century and today. Such topics as “Fascism and Populism”, and “The Far-Right in Historical Perspective”, were particularly provocative and engaging, albeit conclusions were generally left open-ended. As neither debate was capable of maintaining a strictly historical perspective, concerns over current events and present-day issues openly bled through. It would appear that while most panelists stopped far short of applying the term fascism to the contemporary context, aggressive far-right politics was categorically accepted as an existential phenomenon. The general consensus in a room full of staunchly opinionated academics was ultimately made crystal clear; while fascism may never fully return in all its inter-war manifestations, this… whatever this is... is not a drill. The two remaining keynote lectures seemed to both take a step back from the conceptual study of fascism itself and reflect on its contemporary consequences. Roger Griffin (professor at Oxford Brookes and ComFas executive board member) offered observers an opportunity to consider what a lifetime of study on one of modern society’s most destructive ideologies can look like. Most known for recognizing palingenesis is an essential characteristic of fascism, Griffin reminded the audience that even he was met with cynicism for researching what was at the time a decidedly defined concept. His loose anecdotal delivery was as much an inspirational call to action as it was the introspective musings of a venerated thinker under a deserved spotlight. In a field where few would willingly call their work entertaining if nothing more, Griffin provided that relief. Finally, Péter Krekó (professor of political science at Eötvös Loránd University of Sciences (ELTE) in Budapest) obliged the request to speak on behalf of the political situation in Hungary. Krekó recognized that the term fascism in the current political and social climate has been abused to the point of negligence, but argued that its continued study can facilitate education and understanding of far-right movements in the 21st century. With regards to whether ComFaS need not/should not engage in contemporary political analyses, the conversation was unnervingly applicable. 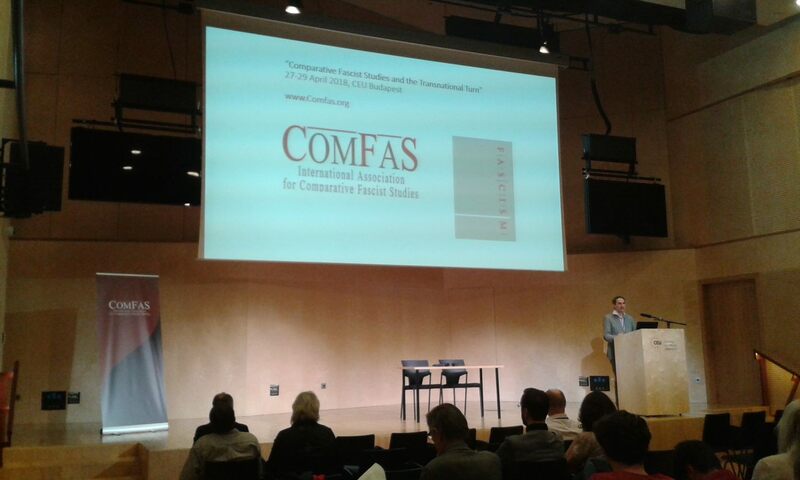 Beyond the noted success of these valuable academic discussions, the convention concluded with a set of reflections and recommendations on directions of future ComFaS actions. The first deals with the regretfully disproportionate female representation still present in the field of comparative fascist studies, in general. Reflecting this situation, although there was a consequential participation of women to the convention and a truly enlightening panel devoted specifically to gender and fascism, there was still a noticeably male-dominated participant roster. Second, recognizing the handful of compelling case-studies on South America, which offset a complete European regional monopoly, the inaugural ComFaS convention was predominantly Euro-centric in scope. These issues are disappointingly demonstrative of the broader inequalities in academia in general, and history and fascist studies in particular, whereby the paradigms of western and male-dominated thought seemingly continue to prevail. The organizers and the participants took stock of these issues; they expressed their hope that, going forward, ComFaS will not only frontally address such inequities but become an arbiter in promoting balanced representation within the academic community. Over the course of the weekend, it was made painfully clear that (most) historians instinctively abstain from entering political debates (pertaining to both current events as well as issues within the field of study itself) that may have consequences on the present or near future. Yet as shown, the study of fascism, even in a strictly historical sense, is inherently linked to the politics of today. This is precisely why ComFaS deserved its place in 2018 and must continue into the future. Its existence, for better or worse, is itself a bellwether of contemporary politics and social movements. Clearly, the field of comparative fascism is a growing discipline, yet the gathering in Budapest has proven that there is much more work to be done on the subject. Despite the demanding itinerary, the convention really only scratched the surface of its potential to facilitate meaningful discussion and collaboration. But it cannot go overlooked that the concept of fascism has (re)entered the popular discourse. Therefore, historians and fellows of the social sciences cannot continue a practice of closed dialogue between themselves; instead, they must ensure access to the leading studies and methods on such issues. ComFaS is the agent through which critical academic analysis can be presented and debated in an atmosphere of sobriety and decorum. ComFaS isn’t just relevant… unfortunately, it’s necessary. Nick Warmuth is a PhD candidate at CEU (Supervisor Prof. Constantin Iordachi). Copyright © 2016. International Association for Comparative Fascist Studies | Powered by Audiosoft IT-Consulting Kft. Title BA MA Dr. Prof.